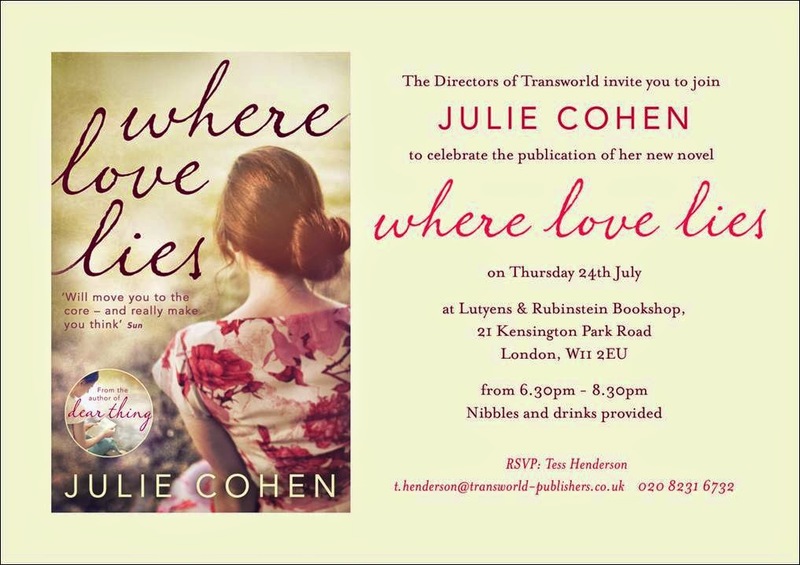 I was so happy to have been invited to the Where Love Lies Book Launch by Julie Cohen, although I tweeted that I was a little nervous as I was going on my own and didn't really know anyone. But the lovely Julie told me not to be nervous at all and to just come find her and the lovely publicist Tess when I got there. When I arrived I found myself outside this beautiful independent bookshop called Lutyens and Rubinstein, I hesitantly went in and saw a group of people at the back of the shop and went towards them. I felt incredibly shy going up to them, but then I saw Tess (from Transworld Publishers and who invited me) and then I realised I was standing right in front of Rowan Coleman (Author of The Memory Book) and Cathy Bramley (Author of the Ivy Lane series). I was so pleasantly surprised to see them and got chatting to them. Then Julie Cohen came up to us and gave a lovely spray of Frangipani perfume which is the scent the protagonist in the book keeps smelling, which I thought was a really nice touch. Suddenly I realised I was in a bookshop full of amazing authors. I met Carole Matthews who is so lovely and was so chuffed to meet. I also met Stephanie Butland (Author of Surrounded by Water), Amanda Jennings (Author of The Judas Scar) Rosie Blake (Author of How to get a (Love) Life) and I finally got to meet Hannah Beckerman :). So I was feeling quite fangirly lol. Julie then went to give a speech and read a passage of her book and she read it so beautifully. And she also kindly signed my book and had a photo with her. Overall I had an amazing evening. Everyone in that bookshop was just so nice and friendly, so my worries of being stuck in a corner on my own never materialised. Thank you for a great evening Tess Henderson and again it was amazing to meet so many authors and of course the truly wonderful Julie Cohen.